Philippines lead climate negotiator Naderev "Yeb" Saño tearfully pleaded with nations yesterday to stop the "madness" of rising greenhouse gas emissions and, describing the devastation Typhoon Haiyan has wrought in his country, declared a hunger strike until governments take action on climate change. His emotional appeal at the opening of U.N. climate talks in Warsaw was greeted with a standing ovation by hundreds of diplomats and climate activists, followed by three minutes of silence to commemorate victims of the storm, which has claimed more than 10,000 lives. "The devastation is colossal. And as if this is not enough, another storm is brewing again in the warm waters of the western Pacific. I shudder at the thought of another typhoon hitting the same places where people have not yet even managed to begin standing up," Saño said. 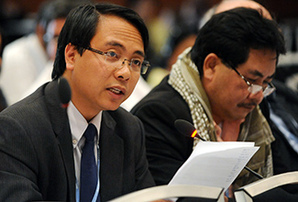 Lead climate negotiator for the Philippines Naderev "Yeb" Saño has announced he will fast during the next two weeks of U.N. climate talks until nations take "meaningful" action. Photo courtesy of the International Institute for Sustainable Development. "To anyone who continues to deny the reality that is climate change, I dare you to get off your ivory tower and away from the comfort of your armchair," he said. "What my country is going through as a result of this extreme climate event is madness. The climate crisis is madness." The veteran negotiator is no stranger to tearful U.N. speeches. In a recurring bout of tragic timing for the Philippines, the country was struck by another massive typhoon just before last year's Conference of the Parties (COP) to the U.N. Framework Convention on Climate Change in Doha, Qatar. Typhoon Bopha killed more than 1,000 people and left almost 80,000 others homeless when it made landfall in December, making it the Philippines' deadliest storm -- until Haiyan. Saño rose to near rock-star status in Doha when he begged for action. "Please," he said then, his voice breaking, "Let 2012 be remembered as the year the world found the courage to find the will to take responsibility for the future we want. I ask of all of us here, if not us, then who? If not now, then when? If not here, then where?" In a telephone interview with ClimateWire over the weekend as he juggled his duties in Warsaw with frantic phone calls back home checking on the fate of loved ones -- Typhoon Haiyan made landing in his father's hometown of Dulag -- Saño sounded almost resigned. Will another 'sobering reality' have an impact? He said he has been overwhelmed with words of sympathy for his country's plight and is grateful for them. But, he said, he no longer believes it will translate into greater ambition to cut carbon emissions. "I don't have any illusion that tragedies like this will muster the political will from rich countries to take concrete action," Saño told ClimateWire. "I've been in this process a long time, and tragedies have happened left and right. But urgency remains low." By Monday, though, Saño determined he would continue to use emotional appeals to move the hearts -- and maybe the policies -- of major emitting countries. "In solidarity with my countrymen who are struggling to find food back home, I will now commence a voluntary fasting for the climate. This means I will voluntarily refrain from eating food during this COP until a meaningful outcome is in sight," he said. Saño said his family is still getting its bearings post-Haiyan. The typhoon made landing in the coastal town of Dulag, his father's hometown. "We were worried sick because my mother is still in the area," he said. On Saturday, she was able to post to Facebook that she was all right, but, Saño said, "we're still waiting to hear from all the other relatives." The weight of Typhoon Haiyan weighed heavily on everyone throughout the opening day of the talks. U.N. climate chief Christiana Figueres called it part of the "sobering reality" of rising global temperatures and told delegates that fighting climate change is not a game. "There are no winners and losers; we all either win or lose in the future we make for ourselves," she said. A looming issue over the coming weeks will be the creation of an institution to both study and provide funding to countries suffering losses from climate impacts to which they are unable to adapt. In his conversation with ClimateWire, Saño said the impact of Haiyan underscores the need for such a "loss and damage" mechanism. The issue is one that has divided rich and poor nations. The United States and others say they are eager to help vulnerable countries but reject the notion that they are liable for damages from decades of emissions. But with such a mechanism, Saño said, his country in the wake of Typhoon Haiyan "would be able to have a task force for getting necessary resources. If the loss and damage mechanism were in place, at the least, the Philippines would have a means to access resources." U.S. negotiator Trigg Talley, speaking in Warsaw yesterday, said, "The U.S. is highly sympathetic to countries that are vulnerable to the worst impacts of climate change. When there is a disaster of tragic proportions such as we've seen in the Philippines, the U.S. is among the first there." Talley said the United States wants to help vulnerable countries work within current institutional infrastructure to minimize climate risk and maintained a preference for "cooperative efforts" rather than a focus on compensation, which he said "frankly, poses technical and political challenges to implement." Meanwhile, Saño argued, countries must start putting forward concrete financial pledges this year to make good on a 2009 promise of mobilizing $100 billion annually by 2020. A still-unknown portion of the funds will flow through a new Green Climate Fund aimed at helping developing countries develop clean energy and build resilience to weather disasters. That fund, though, is an empty shell. "We cannot afford a fourth COP in a row where the Green Climate Fund remains empty," he said. According to Talley, the United States expects to announce that it has given $2.7 billion this year for international climate mitigation and adaptation efforts, an increase over the $2.3 billion it gave in 2012. Alden Meyer, director of policy and strategy for the Union of Concerned Scientists, said climate activists will no doubt point to the tragedy over the next two weeks of talks as proof of why the world needs tougher mitigation efforts and funding for protecting communities from disasters. But sparking action, he said, will take more than eliciting pity. "In a sense, it's a question of whether people sympathize or if they start to identify with people in the Philippines," he said. Citing Superstorm Sandy in the U.S. Northeast, flooding in Colorado and other recent disasters, Meyer said the key is to "connect the dots and show the pattern of extreme weather events and what the future holds." Athena Ballesteros, a project manager at the World Resources Institute think tank who works with the Philippine delegation, said the country has set aside 1 billion pesos ($22.8 million) of its own money under the People's Survival Fund, which will be used to help victims. Aid, she said, is likely being slowed because the money is supposed to be administered locally -- yet local governments where Typhoon Haiyan hit have utterly collapsed. Still, Ballesteros said, the fund is "a very powerful message that the Philippines is not going around with a begging bowl. This is money for and by the Filipino people to cope with the impacts of climate change." Yet even more can be done, she said, with global assistance. "The Philippines will have to exercise leadership in Warsaw in advancing the negotiations," she said. Correction: An earlier version misstated the currency for the money the Philippines set aside in the People's Survival Fund. It is 1 billion pesos, not dollars.